The Rectifier Wärtsilä JOVYREC SRM1000 is distinguished by its low ripple and is an ideal charging device for starter batteries, vented/sealed lead batteries and NiCd batteries. Moreover that the Wärtsilä JOVYREC SRM1000 is exceptionally suited as a power supply for DC loads / consumers. 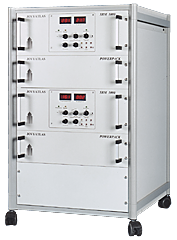 Using the Wärtsilä JOVYREC SRM1000, DC UPS systems with output voltages of 12, 24, 48 or 60 V can be created in no time. Because of its connectability in parallel, you can boost the performance at any time. Redundant designs are simple and convenient to make. At your request, we can supply DC UPS system in a cabinet design to your requirements. By means of a multitude of monitoring devices, you can be sure that the connected load is always supplied with the correct voltage. The device's installation, operation and commissioning are easy. Moreover that the device is largely maintenance free.